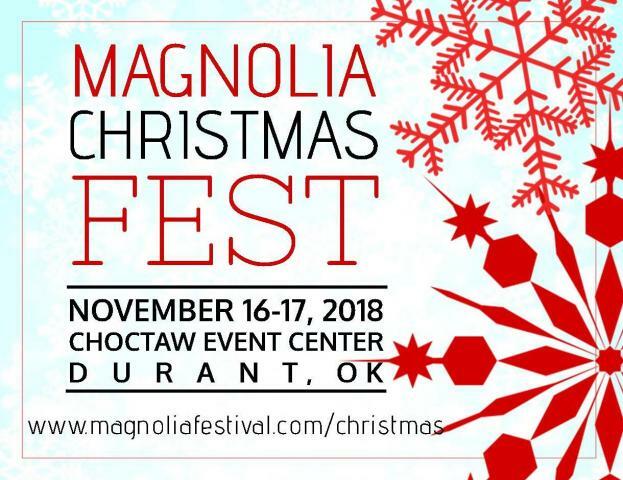 Kick off your holiday season at the 2nd annual Magnolia Christmas Fest, November 16-17 at Choctaw Event Center in Durant. Enjoy unique shopping booths, food vendors, live/local entertainment, children's activities, photos with Santa and much more! A portion of proceeds benefit the Jon Hazell Magnolia Festival Education Scholarship Fund at Southeastern Oklahoma State University. Vendors (craft/product vendors only) interested in booth space, can find an application here or at www.magnoliafestival.com/chris... or at the Durant Area Chamber of Commerce office (215 N 4th Ave). For more information on the Magnolia Christmas Fest, visit www.magnoliafestival.com/chris... or call 580-924-0848.